'Call me Clive' and throughout this book I have stuck to this habit. It is 'Clive' , not 'Brittain' , you will meet in these pages. " "Want to see a man doing what he was destined to do, doing what he is totally absorbed and happy doing? Watch Clive Brittain with his horses at Carlburg Stables, Bury Road, Newmarket. " Racehorses respond directly to a person's voice and gestures. The tone of the voice especially. Opening communication and understanding channels on all levels. Magic. "Some of the other kids on the estate would try it and then chicken out but I was determined ... "
"Calne, Wiltshire. The little scrap who arrived on December 15 1933 and who lived his early years at 9, Priestley Grove, Calne, enjoyed a family life typical of the countryside at the time: busy, companionably and shorn of luxury, although the big family usually managed, somehow or other, to make ends meet. " How Clive communicated with a bunch of wild ponies, and took a few jobs to bring in some pocket money. At the end of 1948 Clive went to see Herbert Blagrave for a job. He was a private trainer and he already had an apprentice. This was about the end of 1948 and he was full up. He said, "Try Noel Murless down the road" . I saw the stable secretary first, a Mr Cotterill, a great old character. He looked at me and said, "You'll be too big" , and more or less turned me away. But I was never one for being turned away and so I waited until Sir Noel came out. I said that Mr Blagrave had sent me and that I wanted a job as an apprentice jockey and he took me on for a month's trial. " "It was a moment that determined the shape of Clive's life. The month's trial developed into a relationship of mutual respect that was to last, apart from Clive's two years of National Service in the Army, for the next 23 years. Until Sir Noel Murless began thinking of retirement and Clive set up on his own, he spent those 23 years handling some of the best animals in the country, horses like Petite Etoile, and Crepello, Aurelius and St Paddy, Royal Palace and Busted. And if that was why Clive later knew how to get the best out of the best when he handled Classic contenders at Carlburg, he made his own contribution too in the Murless yard, dealing with the awkward squad. "If you didn't say 'Good morning' you would get a boot up your arse. And if it wasn't a good morning you'd get a boot up the arse for saying so. " Mick Leaman, fellow Murless apprentice "
Clive moved from Beckhampton to Newmarket with Sir Noel Murless and all his horses, the lot in one massive move, pages 23 - 38. "Clive served his 7 year apprenticeship with Sir Noel Murless plus a further 16 years. Clive was in the right place with the right man for 23 years. "Sir Noel Murless had just taken over at Beckhampton from Fred Darling and when I first went to Beckhampton there were seven horses there who were savages. Red-carded. You weren't allowed to go in with them unless there was someone with you. Within three years Sir Noel had changed the system and brought in a more feeling regime. The savage horses disappeared. It was a great lesson. At evening stables they were held with three rack chains. One from the hay net to the head collar and one each side, otherwise they would have ripped you to pieces. There only defence was to bite you or kick you. Sir Noel got rid of those ideas. Seeing the way horses were treated I realised, just as I had with the ponies, that you don't beat them. A lot of the things he did I had already worked out for myself. Sir Noel was a tremendous thinker about the animal's condition and wellbeing and noticed everything. I can remember he would say at evening stables, "That horse was very nervous with you this morning" . "We never had a big conversation. He called me "Calne" because that was where I came from. It was an "Evening Calne". "Evening sir" , "yes, sir" kind of relationship. I would say something like "This horse doesn't like going through the trees on the way to the gallop" and it was about getting the horses to the bottom of the gallop with as little stress as possible. "For lads in those days it was pretty spartan. We lived in big rooms like barracks. In the winter they were running with condensation. There was no heating but you had a bed and clean sheets for the bed once a week.. We were always pretty well fed in the canteen run by Mrs Barclay, she was a very kind woman and we got good wholesome food. " "Clives's friend and long time feed man Mick Learman, whom he tempted back into racing after 16 years in Clark's shoe factory when he started up, was a good boxer. We tend to forget thev physical stature of many of the lads in stables in those days. Mick won several boxing titles and was beaten in the final one year in the stable lads' championship - an event that was once a mainstay of the racing year but finally petered out at the end of the 1990's, reflecting perhaps not just the growing number of lasses working in yards but an altogether less macho approach in racing yards. "Mind you , says Mick, it was worse when Fred Darling was still at Beckhampton. 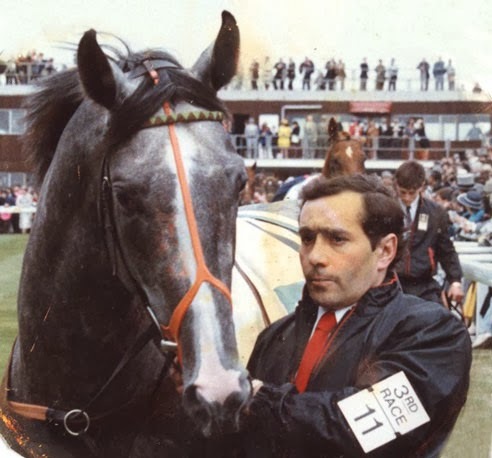 He may have six Derby winners "but he was tough with the horses and could be a mean little man, there was a ten o'clock curfew for the lads and if they were in after that he'd be there the other side of the gate waiting for them with a bullwhip. " "Clive says: " Mick's been my mainstay. The best in Newmarket. I don't have to worry about it. His feedhouse is always absolutely immaculate. He's head and shoulders above anyone else in Newmarket for feeding horses. Nobody could look after a horse better than Mick does. Mind you, he's cost me a fortune. He always wants the best for his horses. " head on the quarters of a big old mate of his called Sunny Way. ST PADDY's forelegs would go between Sunny Way's back ones. It looked dreadful but they never touched each other. After 100 yards or so of that St Paddy would settle pretty well. But he even ran away with Lester, which took a bit of doing. " "As for AURELIUS, the 1961 St Leger winner, he was a savage with a capital S. There was no point hitting him. That was how he turned savage in the first place. As was CREPELLO who in his only two outings as a three-year-old in 1957, won the 2,000 Guineas and the Derby "CREPELLO was a tremendous colt, really powerful behind the saddle, which was the reason he eventually broke down. He had an unbelievable blend if speed and stamina, which meant he was never extended at home. I couldn't name a horse today that might have beaten him. Among the fillies Petite Etoile was a tough mare, more like a colt in many ways. She had a strong personality with a bit of a temperament - she broke her lead rein on more than one occasion. I rode a lot of Sir Noel's good horses, most of them probably, and learned a lot about the character of horses. Even now you see a lot of the characteristics from the family lines. For instance, if a CREPELLO throws a wobbly you are forewarned. " "During my years at Warren Place I never earned more than £17 a week but I set myself an income of £5,000 a year by backing our good horses in top races. We made a decent living - not a fortune but enough always to run a nice car and to have good holidays. "I was never a big gambler in the Barry Hills mode. I set out to win £5,000 a year and stop. I've always believed the lad who has a punt has an interest. It wasn't hurting anybody. You wouldn't do anything to harm or stop a horse. It wasn't in those days a matter of what wasn't going to win but what was going to win. It wouldn't do any damage to the price of the horse. Lads were probably then getting £15 to £20 a week as wages. "With common sense you couldn't help making money on the post odds. You couldn't help backing winners when you worked for Sir Noel. I always backed horses to win. If I won £200 I would bank £175 and start again with £25. My first rule was never to stake more than I could afford to lose. "Two I particularly remember Altesse Royal at 33-1 and Caergwrle at 50-1. We had some very good fillies at the time of Altesse Royal but I always felt she would be the best. She had a lot of nervous energy. She was pacemaker to the others but she never dropped away. It always stuck in my mind that she would be the one. She won the £1,000 Guineas the year Magic Flute would sit behind Altesse Royale and then come with a run and always looked to be her master. But Altesse Royal never dropped her head. I took 33-1 for the Oaks and I won a few quid. It gave me that bit of a nest egg. It wasn't any huge wodge or anything, it was hundreds rather than thousands. 'Murless horses. I concentrated on their home work. I never thought of myself as a gambler when I backed his horses - more of an investor. They were nearly all good-class animals and they were always trying. I made most of the money in Classic races at anti-post odds. You couldn't help backing winners when you worked for Sir Noel. bottom. He didn't take anyone's blueprint - he made his own. He follows his instincts. " Willie Carson on Clive. and two-year-olds, bred and prepared each and every one for superstardom on the global, horseracing stage. That is if saved from being frightened to death beforehand by the bloodhorse illiterate...Clive's perspective on starting out as a trainer Clive Sketches' in his focus on a myriad of owners. "It never sunk in until Lady Murless was talking about Sir Noel's retirement but then I thought for 23 years he had been a good gov'nor and I couldn't see myself having the same relationship with anybody else. "We talked about it. I made a few inquiries and found that Pegasus was coming on the market. Jack Watts had moved to train in the north and it had been left empty and deteriorating. I went to see Chris Bakewell, who had it in trust for the family, and we agreed a three-year lease. When we went in, the lofts were full of chickens, the paint was peeling: the place had been let go. "Willie Carson had moved into a new house at the end of the garden and he introduced me to Mr Gulrajani, an Indian banker with a lot of horses. Willie got him to send me a couple of horses and they were just platers. I started to train them. "Pandit Gulrajani was the owner of the first winner Clive trained, VEDVYAS at Doncaster just ten days into the new season. There was a field of 25 for the Tuxford Maiden Stakes on April 1st 1972. "It was a new adventure going to the races with the first horse I thought had a chance. VEDVYAS had been running in sellers the previous year. An apprentice, ROBERT YOUNG, had been riding him at exercise and the horse worked better for him than for other jockeys who rode out for me at the time. I thought VEDVYAS would win. I told the kid to ride him like he rode him work and not to pressure him much, not to go for the stick. Afterwards Frankie Durr (who finished third in the race on RIO D'OR) told me what a good race the kid had ridden. He asked if I had told him to sit quiet and when I told him I had, he said: If he had moved he would have been beaten.
" VEDVYAS, carrying 8st 7lb, just got up on the line under his apprentice rider ROBERT YOUNG beating MERCHANT OF VENICE, ridden by DUNCAN KIETH. Punters knew very little about C.E. Brittain, Newmarket' and VEDVYAS was allowed to start at 33-1, the first of a series of long-priced winners that were to decorate Clive's career. His winners share of the prize-money was £616.60. "Ten day's later VEDVYAS won the much more important BP Mile Handicap at Aintree. He turned out to be quite a useful performer and at 50-1 in the 35-runner Cambridgeshire at Newmarket on September 30, this time ridden by lightweight DES CULLEN, he was beaten only a head and a nose in a photo- finish behind NEGUS (PHILIP WALDRON) and ROY BRIDGE (MICHAEL KETTLE). That was his best performance. CLIVE says CULLEN, was one of WILLIE CARSON'S most feared riders in a finish. "They were dreadful bullies - horrible horrible people. People look back now through rose-tinted glasses and say what great horsemen they were? Well were they? Sir Mark Prescott on Newmarket in 1972. "Newmarket was very different in 1972. It was for many at the lower end of racing a grim and often brutal place. Sir Mark Prescott, a man with a true feel for his local community, remembers it clearly at Heath House: 'Newmarket was a very, very different place then. I started officially in 1970. At that time there were 35 trainers in Newmarket and 850 horses Now there are 81 trainers and 2,500 horses. (2012) Pages 51 - 61. "Everywhere was run-down. The owners could no longer afford to keep up the big studs as they had done and until the Arabs came on the scene and re did them they were pretty tired. I was unbelievably lucky to be given the chance to train here but it was all falling down. Whether it was the war, whether that had something psychologically to do with it of whether it was entirely financial I don't know but it had a run-down feel about it. Newmarket was tired. "The lads' accommodation was appalling. They were paid a pittance. Single lads serving a seven year apprenticed then. There were some great horsemen but there was an underclass of those men who were absolutely no good and they were allowed to get away with murder. It took a crisis to change that culture, the stable lads' strike of of 1975. "The strike was very cathartic. In retrospect it was a ghastly, ghastly time. But it was very good because the owners realised they'd got to pay a proper rate for having horses trained. "One of the problems was the lack of graduated wage structure in British racing. In many yards a man with 20 years' experience was getting no more than a 16-year-old starter, so the job tended to attract gamblers and drifters. That was the Newmarket in which Clive set out as a trainer. But perhaps in those circumstances there was some advantage in being a trainer who had spent 23 years as a lad in someone else's yard. Clive had a major task to bring Pegasus House and Stables back to life before it was ready to house horses in training at work. The British impostors political and horseracing government's wooden horses. BHA do not take the horses into consideration at all, whilst pretending to regulate British horseracing The methods they use to run this sport are all aimed to support hefty financial government gain. No matter at whose expense, in secret. Secret laws popped in to cover the tracks of evil past politicians and lawyers. These government parties focus on horses, cattle, sheep and chicken all reared and slaughterhouse bound. End of story. What sufferance inflicted upon them whilst they are alive, matters not one jot to any of them. A financial means to launder huge amounts of other people's money at the animal's expense. And we are fool enough to allow this long outdated evil political practice to continue on. British governments are using monies they have stolen and are stealing from the British Equus Zone of horseracing every day, left on going over decades.